A few weeks ago I was planning on spending a day adventuring around Boston with one of my best friends and favorite travel companions. We were planning on getting brunch, walking some of Boston, and checking out the latest exhibit at the MIT List Visual Arts Center, when our plans got rerouted: my phone decided it had lived a long and healthy life and was going to take a break. Forever. Three hours later I was walking out of Verizon with a new phone, slightly traumatized. Because my old phone had given up to the point it wouldn’t even turn on, I wasn’t able to move things like pictures over to my new phone. After realizing I hadn’t backed up my phone since December 2017, and the baby heart attack that came with realizing I lost all my photos from then on, I went on Facebook and started screenshotting some of my favorite photos so I felt less like I was starting all over. Something I realized? I had a lot of beautiful photos from my summer trip to Europe with one of my best friends (who, coincidentally, was also the one who helped me avoid crying in the Verizon store). But I also realized I had never made time to write about my trip, especially one of my favorite legs of it, my time in Brussels, Belgium. Below are highlights from my trip, things that almost exactly a year later still stand out to me, and make me anxious to not only visit Belgium again, but travel more. My favorite place in Brussels by far was the Grand Palace. The central square of Brussels, it’s surrounded by ornate buildings and is even a UNESCO World Heritage Site. The Grand Place was only a five-minute walk from the beautiful Airbnb my friend and I were staying at, and it made a cute place to grab some waffles and lounge around in the sun. What’s particularly interesting about the Grand Place is that in addition to the general beauty, it is the location for many of Belgium’s most prominent events. Every other year in August there are a million flowers (literally) laid out in different patterns creating a ‘flower carpet’ that looks stunning in photos, and during every July there is Ommegang. Brussels’ Ommegang is a traditional medieval pageant, essentially a reenactment of the entry of Emperor Charles V and his son Philip into Brussels in 1549. There are hundreds of people dressed in historical clothing throwing flags, riding horses, playing instruments, and, my personal favorite, dancing and even fighting on stilts. When my friend and I planned our trip, we didn’t plan around Ommegang, trying to make sure we were in the city during such a big event. We hadn’t heard of Ommegang before our visit. Truthfully, we didn’t even know what Ommegang was as we were watching it. We had just heard the morning of that there was a big festival in the square later in the evening and decided it would be fun to check it out. What we were completely unprepared for was how much fun it was going to be. I had been feeling tired prior to attending and wanted to go for only a few minutes – enough to get a feel for it, but short enough I could go home and sleep off my jet lag. Only twenty minutes into the event I realized it was a production worth staying for. While I didn’t understand the historical significance of the event they were reenacting, it was incredible getting the chance to experience an event that got so many people so excited. It felt very similar to the way the Boston Marathon feels for Bostonians – excitement mixed with pride for your city and traditions it has. It also made me appreciate and understand Belgian culture more. Not only was I able to be present for a huge event, but I was able to talk about it with people my friend and I ran into at restaurants and museums. I was able to be a part of the city in a way I wouldn’t have been able to otherwise, enhancing my travel experience and making me that much more excited about my trip. I won’t act like I was ever into comic books as a child. While I’ve watched every Marvel movie to come out in recent years, by no stretch of the imagination can I pretend that when I say ‘well, in the comics…’ about an end credits scene did I actually read the comics instead of just the Wikipedia page about the comics. Needless to say, I wasn’t expecting to enjoy the Belgian Comic Strip Center as much as I did. A large museum, the Center highlights all things comic book, from the invention to famous comic strips even I was able to identify to the history of the techniques behind them. What I enjoyed most about the museum was how it felt like an intersection of a history and an art museum. The first section of the museum was centered on the beginnings of the comic strip. How did it start, when did it get popular, what were some movements that really popularized the art of comics? After this exhibit the museum then shifted focus from the history to the actual artistry of comics – how are they made, what emotions are more difficult to capture on paper, how different styles of art and comics developed. And among all this? Incredible pieces of art. I was able to join in on Tintin’s adventures and explore a ‘life-sized’ Smurf village. There were comics highlighting how stories can be told with only the simplest of characters and ones where if I didn’t know any better I would have thought I was looking at a photograph. I developed an entirely new appreciation for comic strips after my time at the Comic Strip Center. Experiences like this are some of my favorites because it forces me to shift my perspective. While on a small scale, it reminds me that I should always be challenging my beliefs and opening myself up to new adventures and opportunities. 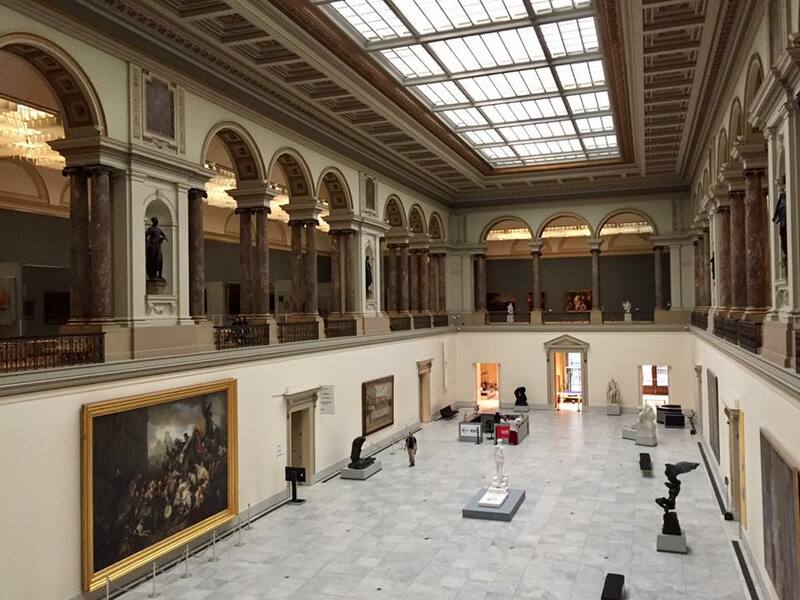 Another museum I would recommend visiting in Belgium is the Royal Museum of Fine Arts. My friend and I went on a gloomy day, giving us a perfect reprieve from the rain while still being able to experience one of the city’s highlights. The Royal Museum’s organization alone impressed me. There were three floors above ground, as well as four additional floors in the basement of the museum available to visit. You were able to purchase access to certain exhibits based on interest, so if you were only interested in ‘Old Masters’ you could completely skip other parts of the museum for a cheaper price. While I don’t understand art to the degree I would like to, I was impressed by how easy the museum made it to understand what I was looking at. Beyond the typical plaques that describe the painting and artist, there was a map provided that showed why certain paintings were grouped together, as well as highlighting key pieces in the museum you shouldn’t miss. Equally as impressive was the architecture of the museum itself. When you walk in there is a courtyard-esque feel to the space. The ceiling is glass allowing natural light in, and while the ground level is wide and has art hung on the walls, the second floor is also open, with beautiful arches that allow you to glimpse some of the art you will be getting the chance to see later. 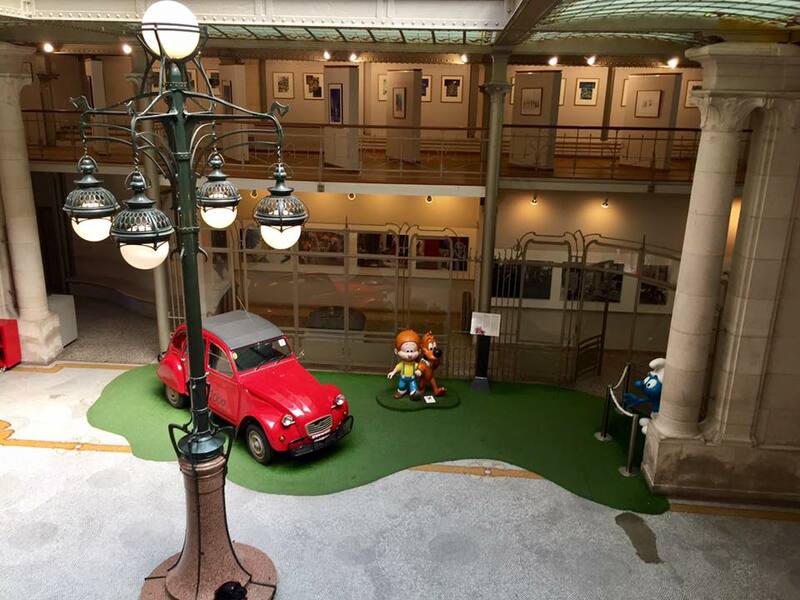 The entire atmosphere, combined with the masterful paintings on the wall, makes the museum a necessary stop in any Brussels visit. If the recent coverage of Prince Harry and Meghan Markle is anything to go by, people love royalty. But while it might feel as though the only royalty talked about nowadays are British, Brussels delivers on their princes and princesses as well. 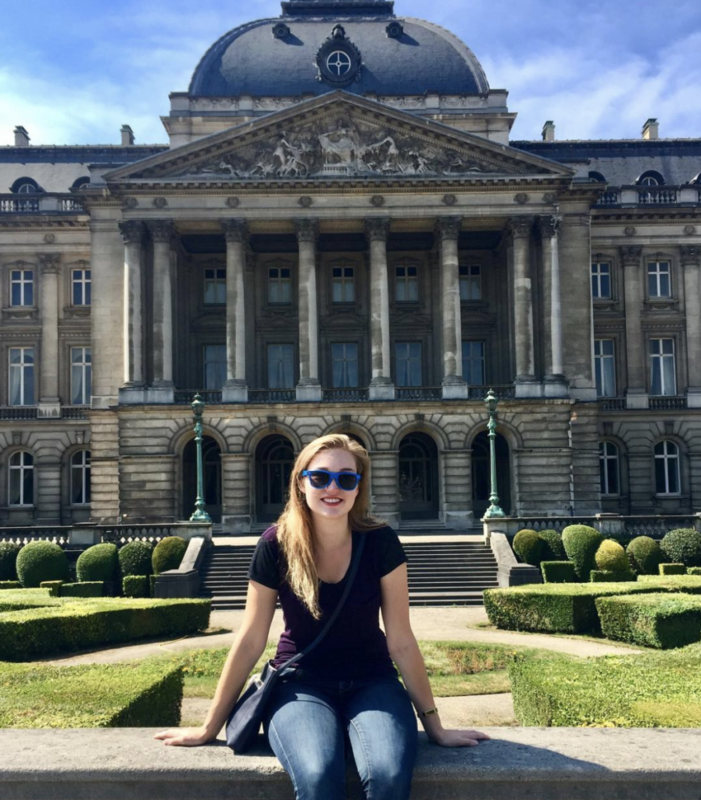 While not where the King and Queen of Belgium reside, the Royal Palace of Belgium is a beautiful building worth checking out. It has a similar feeling to that of Buckingham Palace, although much less crowded, what with its towering gate and royal guards. What else makes the Royal Palace worth checking out is its proximity to another Belgian visit necessity: Brussels Park. Right in front of the palace lies Brussels’ biggest park (albeit only 32 acres) which has all the makings for a lazy afternoon stop – rolling grass, fountains, and even a few ponds. And the park is even at times the center for events. During my visit, my friend and I stumbled across a Renaissance Fair being hosted in the park. The majority of the park with covered with medieval activities, including sword fighting (which resulted in a horde of little kids with pool noodles hitting the ‘professionals’ until they surrendered) and craftsmen selling goods. While it definitely isn’t what I imagine a typical weekend in the park to be like, it was fun and a relaxing way to spend an afternoon. I am not a big fan of shopping. I especially hate being dragged shopping when traveling. My logic is that if I only have a few short days, why should I spend precious hours trying on shoes that are only going to hurt my feet? 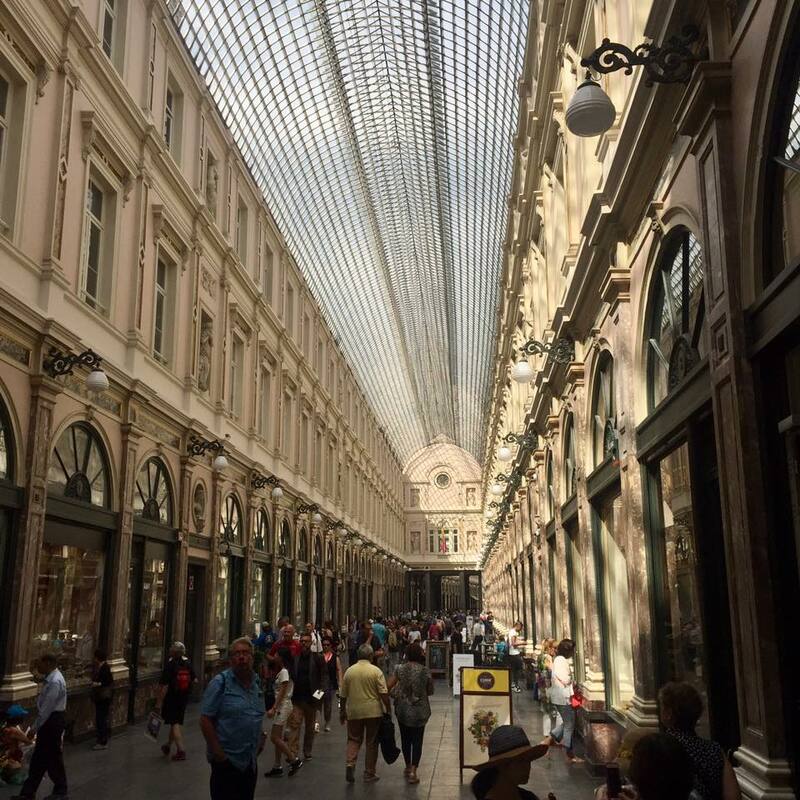 But in Brussels, a place dedicated to shopping I’m glad I didn’t miss was Les Galeries Saint Hubert, an arcade of shops in the middle of the city. When my friend suggested we visit, I was not excited. Shopping? When I could be exploring churches and museums and walking around lost, finding new things? Hard pass. I can buy a new shirt when I’m home, thank you very much. Thankfully she explained that the arcade was famous not for the stores it had inside (although they appeared to be very nice and very much out of my price range) but for the beautiful architecture. And if ever a mall in America was as stunning as this arcade was, I would most likely complain a whole lot less when forced to go brave a shoe store. The arcade was beautiful. An indoor courtyard, featuring a ceiling completely made of glass, allowing the sun to shine in. Combined with the earthy pink/yellow walls, it appeared to be glowing from within. Even when it was raining, and my friend and I cut through it as shelter from the downpour, there was still a magical quality to it not easily overlooked. For every vacation I’ve ever taken, I have had to create a strict budget for it. Part of this process requires figuring out what matters most to me when traveling. For instance, I don’t mind taking a discount airline and being squished for hours on a flight, but I will always spend extra money to make sure the place I’m sleeping is in a safe area and has a lock on the door. Something I find myself skimping on when traveling is food. I would rather pick up some groceries and eat bread and fruit for breakfast than spend money going out to a fancy brunch if it means I’m able to visit any museum I want to later in the day. What I appreciated about Belgium was that I was able to get fantastic food while still managing to make it one of the cheaper parts of my day. 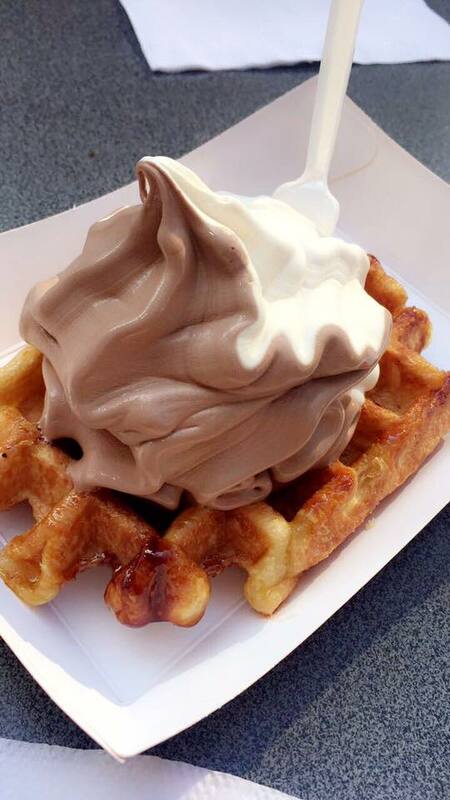 The standouts from my Brussels trip are still apparent: chocolate, beer, and waffles. 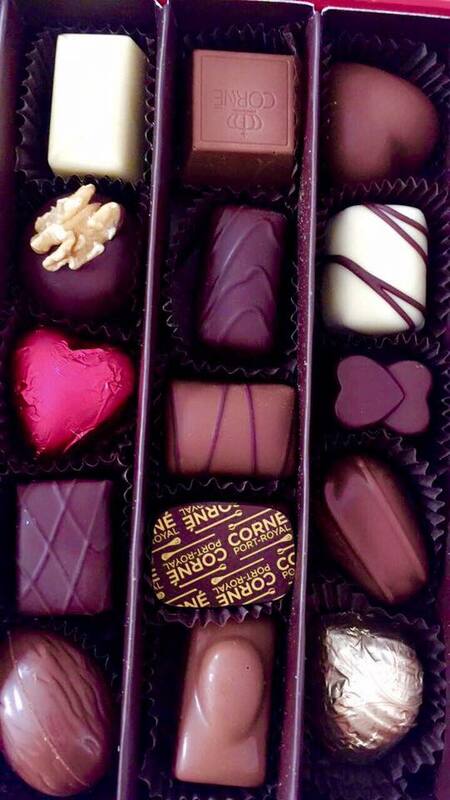 Each night my friend and I went out and discovered new types of Belgian chocolate. We surveyed everywhere from cheap stores on the outskirts of town to fancy and more expensive collections from stores in Les Galeries Saint Hubert. And no matter where we went, it was fantastic, not to mention creative. While I tended to be a chocolate purist, having the opportunity to taste ‘English Fog Chocolate’ and ‘Rose Chocolate’ was definitely not something I was going to pass up. And the Belgian beer also turned into an event! 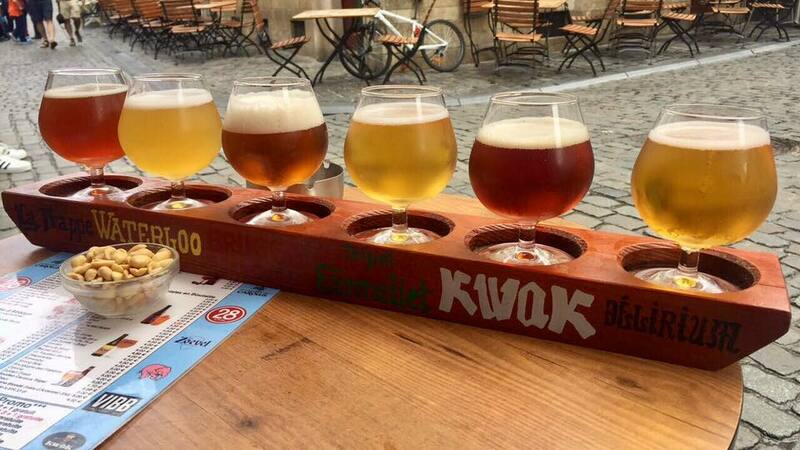 My friend and I were not the biggest drinkers, but we sat down mid-afternoon and had a flight of Belgian beer. When I start to really appreciate food is when it becomes an experience, rather than a necessity. And getting to sit outdoors, people watching, while discovering which types of beer I tend to like more than others (for me, darker ones, for my friend, lighter, making flights essentially perfect splits for us) is a fabulous afternoon. But then you have the waffles. Amazing. Spectacular. Stunning. Exquisite. Mind-blowing. Even a year later I can clearly recall how fantastic they were. Why I didn’t remember from my lesson with pierogies in Poland that sometimes food is just better in certain parts of the world I don’t know, but Belgium knows how to make waffles. For only about a euro (before the Nutella, strawberries, or ice-cream we consistently added was factored in) I had a heart-stopping moment with food. They were warm, perfectly baked on the outside while still fluffy on the inside, just sugary enough to be amazing without being overwhelming. And they had a distinct taste I’m sure someone more practiced than me would be able to describe, but I can only call heavenly. Trust me, when the girl who penny pinches on food is waxing poetry, you know it’s fantastic. Brussels was amazing overall. It was a fantastic start to what became an unforgettable trip with one of my best friends, and a city that I, while walking around, could picture myself living in (making it join the ranks of cities like Boston and Portland!) I will definitely be back in Belgium at some point in my life, hopefully to explore the other amazing cities as well as to revisit Brussels. This entry was posted in Europe, Travel and tagged belgium, brussels, europe, explore, top-attractions, travel. Bookmark the permalink.